Christina R. Silva, US Marine Corps Veteran meets Valiant Warrior, Medal of Honor Winner, Colonel Jack H. Jacobs, Col. US Army (Ret). Educating Our Veterans highlights US Armed Forces Valor, Resilience and Selfless Service. 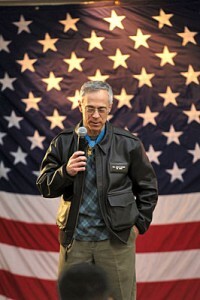 With sincere gratitude and humility CRS accepts this once in a lifetime, up close and personal conversation with Colonel Jack H. Jacobs who is still giving back with his heart to motivate and encourage smooth transitions for veterans with known professional industry objectives. Key notes from Colonel Jack Jacobs motivating lecture gives answers that will enlighten the hearts of Americans with a transparent and unique perspective. We cherish the men and women who have given their lives for us in service, those who are deployed and currently serving and those who have served including their loved ones; we thank you for the sacrifice. Special thanks to Medal of Honor leader, Colonel Jack Jacobs, Mr. John Powers, NYFA Director of Veterans Services and Ms. Brandice Brenning, NYFA Veterans Coordinator and OneNinth LLC for this humbling industry experience. CRS Productions continue Giving Back In the Way of Safety and Education which is a passionate mission of a lifetime for all to Bee Safe. Brought to you by: Nothing Bundt Cakes of Manhattan Beach. Learn more about the astounding accomplishments Colonel Jack Jacobs by reading his book, “If Not Now, When?”.